From the Italian unification and as Rome in 1871 became the capital of the new Kingdom of Italy, the Holy See lacked a territory, which it earlier had enjoyed ever since the early Middle Ages. This international-Catholic problem was finally solved through the 1929 Lateran Treaty. The Lateran Treaty (Italian: Patti Lateranensi; Latin: Pacta Lateranensia) was one of the Lateran Pacts of 1929 or Lateran Accords, agreements made in 1929 between the Kingdom of Italy and the Holy See, settling the "Roman Question". They are named after the Lateran Palace, where they were signed on 11 February 1929. The Italian parliament ratified them on 7 June 1929. 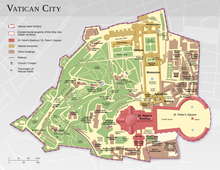 It recognized Vatican City as an independent state, with the Italian government, at the time led by Benito Mussolini as prime minister, agreeing to give the Roman Catholic Church financial compensation for the loss of the Papal States. In 1947, the Lateran Treaty was recognized in the Constitution of Italy as regulating the relations between the state and the Catholic Church. During the unification of Italy in the mid-19th century, the Papal States resisted incorporation into the new nation, even as all the other Italian countries, except for San Marino, joined it; Camillo Cavour's dream of proclaiming the Kingdom of Italy from the steps of St. Peter's Basilica did not come to pass. The nascent Kingdom of Italy invaded and occupied Romagna (the eastern portion of the Papal States) in 1860, leaving only Latium in the Pope's domains. Latium, including Rome itself, was occupied and annexed in 1870. For the following sixty years, relations between the Papacy and the Italian government were hostile, and the status of the Pope became known as the "Roman Question". Negotiations for the settlement of the Roman Question began in 1926 between the government of Italy and the Holy See, and culminated in the agreements of the Lateran Pacts, signed—the Treaty says—for King Victor Emmanuel III of Italy by Benito Mussolini, Prime Minister and Head of Government, and for Pope Pius XI by Pietro Gasparri, Cardinal Secretary of State, on 11 February 1929. It was ratified on 7 June 1929. The agreements were signed in the Lateran Palace, hence the name by which they are known. 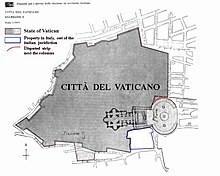 The agreements included a political treaty which created the state of the Vatican City and guaranteed full and independent sovereignty to the Holy See. The Pope was pledged to perpetual neutrality in international relations and to abstention from mediation in a controversy unless specifically requested by all parties. In the first article of the treaty, Italy reaffirmed the principle established in the 4 March 1848 Statute of the Kingdom of Italy, that "the Catholic, Apostolic and Roman Religion is the only religion of the State". The attached financial agreement was accepted as settlement of all the claims of the Holy See against Italy arising from the loss of temporal power of the Papal States in 1870. The sum thereby given to the Holy See was actually less than Italy declared it would pay under the terms of the Law of Guarantees of 1871, by which the Italian government guaranteed to Pope Pius IX and his successors the use of, but not sovereignty over, the Vatican and Lateran Palaces and a yearly income of 3,250,000 lire as indemnity for the loss of sovereignty and territory. The Holy See, on the grounds of the need for clearly manifested independence from any political power in its exercise of spiritual jurisdiction, had refused to accept the settlement offered in 1871, and the Popes thereafter until the signing of the Lateran Treaty considered themselves prisoners in the Vatican, a small, limited area inside Rome. To commemorate the successful conclusion of the negotiations, Mussolini commissioned the Via della Conciliazione (Road of the Conciliation), which would symbolically link the Vatican City to the heart of Rome. The Constitution of the Italian Republic, adopted in 1947, states that relations between the State and the Catholic Church "are regulated by the Lateran Treaties". In 1984, an agreement was signed, revising the concordat. Among other things, both sides declared: "The principle of the Catholic religion as the sole religion of the Italian State, originally referred to by the Lateran Pacts, shall be considered to be no longer in force". The Church's position as the sole state-supported religion of Italy was also ended, replacing the state financing with a personal income tax called the otto per mille, to which other religious groups, Christian and non-Christian, also have access. As of 2013[update], there are ten other religious groups with access. The revised concordat regulated the conditions under which civil effects are accorded by Italy to church marriages and to ecclesiastical declarations of nullity of marriages. Abolished articles included those concerning state recognition of knighthoods and titles of nobility conferred by the Holy See, the undertaking by the Holy See to confer ecclesiastical honours on those authorized to perform religious functions at the request of the State or the Royal Household, and the obligation of the Holy See to enable the Italian government to present political objections to the proposed appointment of diocesan bishops. In 2008, it was announced that the Vatican would no longer immediately adopt all Italian laws, citing conflict over right-to-life issues following the trial and ruling of the Eluana Englaro case. Italy's anti-Jewish laws of 1938 prohibited marriages between Jews and non-Jews, including Catholics. The Vatican viewed this as a violation of the Concordat, which gave the church the sole right to regulate marriages involving Catholics. Article 34 of the Concordat had also specified that marriages performed by the Catholic Church would always be considered valid by civil authorities. The Holy See understood this to apply to all marriages in Italy celebrated by Roman Catholic clergy, regardless of the faiths of those being married. ^ A History of Western Society (Tenth ed.). Bedford/St. Martin's. p. 900. ^ Constitution of Italy, article 7. ^ "Text of the Lateran Treaty of 1929". www.aloha.net. ^ James Brown Scott, "The Treaty between Italy and the Vatican" in Proceedings of the American Society of International Law at Its Annual Meeting (1921–1969), volume 23, (24-27 April 1929), p. 13. ^ "Holy See (Vatican City) Government Profile 2017". www.indexmundi.com. ^ "CIA Factbook, "Holy See (Vatican City)"" (PDF). ^ "La Chiesa cattolica e il fascismo" (PDF). ^ Pacts between the Holy See and the Kingdom of Italy, 11 February 1929. ^ John F. Pollard, The Vatican and Italian Fascism, 1929–32: A Study in Conflict (Cambridge University Press 2005 ISBN 978-0-52102366-5), p. 43. ^ John Whittam, Fascist Italy (Manchester University Press 1995 ISBN 978-0-71904004-7), p. 77. ^ Gerhard Robbers, Encyclopedia of World Constitutions (Infobase Publishing 2006 ISBN 978-0-81606078-8), p. 1007. ^ Law Library Journal, volume 99:3, p. 590. ^ "How the Vatican built a secret property empire using Mussolini's millions", The Guardian, 21 January 2013. ^ Vatican Journal, p. 59 (entry dated June 14, 1931). ^ "Patti lateranensi, 11 febbraio 1929 - Segreteria di Stato, card. Pietro Gasparri". www.vatican.va. ^ "The Constitution of the Italian Republic, article 7". ^ Elgood, Giles (31 December 2008). "Vatican ends automatic adoption of Italian law". Reuters. Retrieved 9 January 2009. The Vatican will no longer automatically adopt new Italian laws as its own, a top Vatican official said, citing the vast number of laws Italy churns out, many of which are in odds with Catholic doctrine. ^ Zuccotti, 2000, p. 37. ^ a b Zuccotti, 2000, p. 48. Kertzer, David I. (2004). Prisoner of the Vatican: The Popes' Secret Plot to Capture Rome from the New Italian State (Boston: Houghton Mifflin Company). Pollard, John F. (2005). The Vatican and Italian Fascism, 1929–32: A Study in Conflict. Cambridge University Press. ISBN 978-0521023665. Pollard, Jonh F. (2014). The Papacy in the Age of Totalitarianism, 1914–1958. Oxford University Press. ISBN 9780199208562. Riccards, Michael (1998). Vicars of Christ: Popes, Power, and Politics in the Modern World. New York: Crossroad. ISBN 0-8245-1694-X. Zuccotti, Susan (2002). Under His Very Windows: The Vatican and the Holocaust in Italy. New Haven: Yale University Press. ISBN 0-300-09310-1.